Also the app Movies has been added to Android Market. thousands of movies are available starting at $1.99 the bonus is you’ll have them available across your Android devices—so if you rent a movie on your home computer, and it’ll be available for viewing on your phone and/or tablet. You already can rent from Android Market on the web today! Also Google will be rolling out an update to Verizon XOOM customers beginning today. Last but not least for now Google also fires an update to Android 2.2 and above devices in the upcoming coming weeks. Over the last two and a half years, the Android ecosystem has been moving really fast and rapid iteration on new and highly-requested features has been a driving force behind Android’s success. But of course that innovation only matters if it reaches consumers. So today Google announced a founding team of industry leaders, including many from the Open Handset Alliance, are working together to adopt guidelines for how quickly devices are updated after a new platform release, and also for how long they will continue to be updated. The founding partners are: Verizon, HTC, Samsung, Sprint, Sony Ericsson, LG, T-Mobile, Vodafone, Motorola and AT&T, and more are welcome to join. To start, we’re jointly announcing that new devices from participating partners will receive the latest Android platform upgrades for 18 months after the device is first released, as long as the hardware allows… and that’s just the beginning. Stay tuned for more details.ource: GoogleblogWe also launched Music Beta by Google, a new service that lets you upload your personal music collection to the cloud for streaming to your computer and Android devices. With the new service, your music and playlists are automatically kept in sync, so if you create a new playlist on your phone, it’s instantly available on your computer or tablet. You can use a feature called Instant Mix to create a playlist of songs that go well together. You can even listen to music when you’re offline: we automatically store your most recently played music on your Android device and you can choose to make specific albums or playlists available when you’re not connected. The service is launching in beta today to U.S. users and is available by invitation. 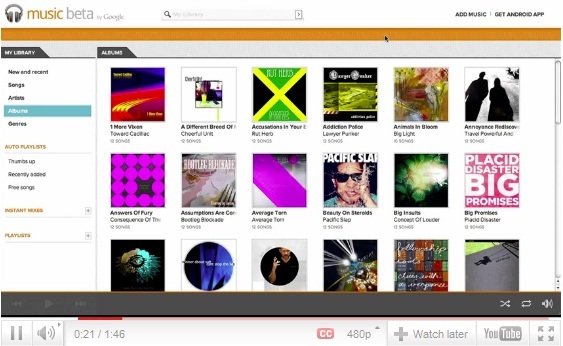 Google Music to stream 20,000 songs for free; launches today at I/O? HTC Flyer flies high: HTC Flyer promotional video released plus Android 3.0 Honeycomb soon?? ?